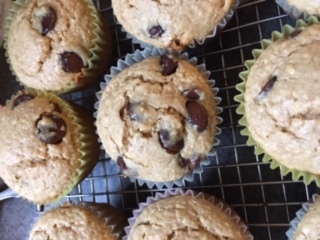 Today’s recipe, Peanut Butter Muffins with Dark Chocolate Chips is courtesy of Kate Scarlata RD, author The Low FODMAP Diet, Step by Step. The muffins are low in FODMAPS and are a good pre-exercise choice for athletes with digestive issues. But even if you have a cast-iron stomach, you’ll still like these muffins simply because they taste yummy, are easy to make, and are handy for breakfast, pre- and post-exercise snacks, and even dessert. FODMAP stands for Fermentable (i.e., gas-producing) Oligo-, Di-, Mono-saccharides And Polyols. These are different kinds of carbohydrates that can be hard for some people to digest. (For example, the di-saccharide lactose in milk is known to cause gas and bloat for people who are lactose-intolerant.) Research with athletes suggests foods low in FODMAPS might help reduce digestive issues (gas, bloat, diarrhea). If you have a sensitive stomach and want to find a local sports dietitian who can help you create a diet low in FODMAPS, use the referral network at www.SCANdpg.org . Prepare 12 -muffin tin with a light coating of oil. In a medium-size bowl, combine all ingredients and beat well. Fold in 1/2 cup of the chocolate chips into batter. Add batter evenly into the 12-muffin tin. Distribute the extra 1/4 cup chocolate chips evenly to the top of each muffin. Bake for 12-15 minutes or until a cake tester comes out clean.